Keith Moehring is business development manager and consultant at PR 20/20, an inbound marketing agency and HubSpot Partner. You can follow him on Twitter at @keithmoehring. He also actively contributes to http://www.PR2020.com/blog. A website is the cornerstone of any marketing campaign. It is the place where customers, prospects, media, competitors, investors, peers and job candidates turn to first when learning more about your organization and its products or services. Because of this, it’s essential that marketers take a leadership role in any company website redesign project. 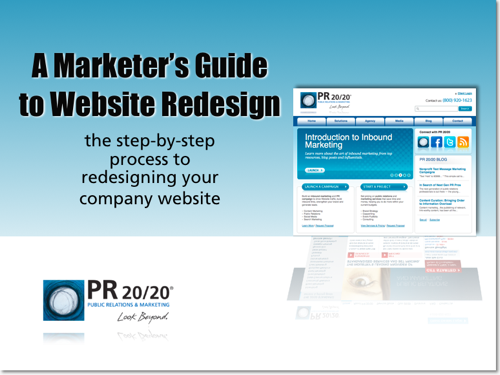 To help you avoid any common missteps, we’ve developed a free ebook — “A Marketer’s Guide to Website Redesign.” The ebook details the six main steps involved in the website redesign process, from the perspective of a marketer who doesn’t have a technology background. Logo file in a vector format (i.e. .EPS, .AI, or .CDR). Main contact information for current website host. Google Webmaster Central, Bing Webmaster Center and Yahoo SiteExplorer verification codes. Branding guidelines and all relevant collateral documents. Page layout and design preferences. To help communicate your vision of the new website, develop a comprehensive creative brief, detailing everything you defined in phase two. Your web team will use this as a guide when designing and building out your new site. Graphic sitemap outlining all pages on your site, including main navigation options. Page layout and design preferences, with screen shots or URLs of examples. Color scheme, including primary, secondary and accent colors. Navigation options you want available on the site. Visitors don’t come to your site for the cool design or fancy navigation; they come for the content. Develop content that is concise, scannable and engaging. It needs to deliver key messaging quickly and clearly, and then drive visitors to take a desired call to action. To help this content get found, it also needs to be optimized avoid priority keywords. Create a keyword map that assigns each page on your site a priority keyword (or two) for which it will be optimized. Define the tone and style of your content. Assign the development of website copywriting to your team’s strongest writer (avoid using multiple authors). Optimize each page after the content has been created. This is the phase where all your hard work comes to fruition. It includes populating the site with all content, setting up 301 redirects, and completing a thorough review of the site to ensure that everything displays and works properly. Create an upload cheatsheet that will serve as a how-to guide for adding content into your content management system (CMS). Before loading content, create all the pages first, and organize them according to your sitemap. Upload all images and graphics into a designated folder in the CMS so they are easy to locate when it comes time to add them to a page. Put together a team internally to upload all content and formatting into the web pages. Perform a quality assurance by checking to make sure all formatting is correct, all links and features work, and that everything displays properly across all browsers. Check that all 301 redirects are working. Log into each search engine’s webmaster center to confirm all verfication code is installed properly, and then submit your XML sitemap. Verify that all analytics tracking code is installed. Review Google Webmaster Tools every few days to ensure there are no pages Google had indexed on your old site that it can no longer find.